Rapper Strongman has officially joined Sarkodie’s highly respected record label, Sarkcess Music, we can authoritatively say. The two signed the contract days ago at the Bet award-winner’s house to officially add the Next Big Thing In Gh reality show winner to the record label. 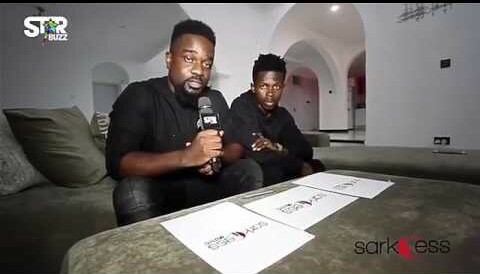 Sarkodie speaking at the signing of the new artiste on his record label expressed joy in having the rapper real name Osei Kwaku Vincent on the record label. “Finally after talking for so many times, we are rapping everything up today. It has been in the pipeline for a very long time but finally, we are about to close it. It is an honour for myself to have this talent (Strongman) involved in the whole Sarkcess movement. The reason why we are here today is to join forces and see what we can do for each other. What we are doing today is to officially sign my boy Strongee on Sarkcess Music which I’m actually happy.” Sarkodie said during the signing. Strongman joins Akwaboah who was signed on Sarkcess Music in March 2016.